DOT GV2006 FITS ALL CANVAS WITH PVC DOTS, KNIT WR. FORMERLY GV12 PROD# | Springfield Electric Supply Co.
Cotton Canvas Gloves with Gripper Dots. 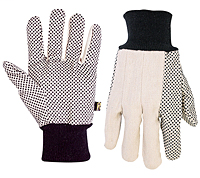 Quality cotton/polyester canvas work gloves with PVC dots for added grip and an overlocking knit wrist to help keep debris out.